Synopsis: A misogynistic and snobbish phonetics professor agrees to a wager that he can take a flower girl and make her presentable in high society. Did You Know? 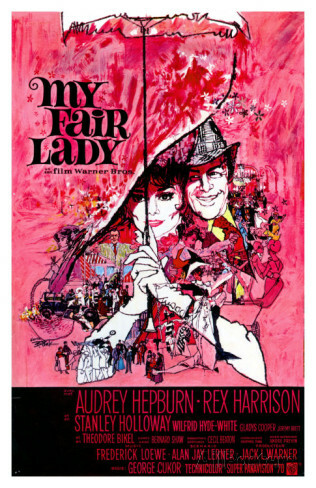 Despite extensive vocal preparation for the role, most of Audrey Hepburn’s singing was dubbed over by Marni Nixon. This was required because the music was not transposed down to accommodate Hepburn’s range. Quotables: ELIZA: Come on, Dover! Come on, Dover! MOVE YOUR BLOOMIN’ ARSE! The only things I like about this movie that I like are the costume design and two or three of the songs. The rest of them I find completely vexing and pestilential on the ears. Eliza’s father and his cronies are the worst, most obnoxious coming relief ever. Peter O’Toole’s performance in Becket was superb and absolutely deserved the Best Actor Oscar over Rex Harrison’s Henry Higgins.